I remember the collective cringing and suppressed giggling in my seventh grade Spanish classroom when we learned our textbook’s word for “disabled”–minusválido. All it took was using the two English cognates within the word to literally translate the meaning as “less valid.” It was so blatantly un-PC that I almost preferred to miss the points on a pop quiz than to answer correctly. I’m ashamed to admit my middle school reaction to the presence or mere topic of disability continues well into adulthood. Whenever I see someone with Down syndrome or amputated limbs, I tense up. I don’t know if I should look away or engage them while pretending they have no handicap. “Don’t stare! If Mom taught you anything, it’s that you shouldn’t stare,” I’d command myself. I then become consumed by the intention to do what’s inoffensive, or at least doesn’t portray me as an atrocious excuse for a human being. If the goal is to raise the status of disabled people, then isn’t assuming a best case scenario that’s merely palliative actually just perpetuating inequality? I’m talking about the charities donating electric wheelchairs to veterans and the organizations whose ultimate mission is for autistic people to live away from their families. Overall we seem more concerned with finding new, more sensitive vocabulary than changing the reality of disability. Is that the best we can do? Until I visited Asia, I didn’t recognize any viable solutions. Sadly I figured many of the world’s disabled, discarded, and devalued people were doomed to remain unproductive drains on the rest of society. To change my outlook I needed to first tire of the touristy activities offered in the otherwise quaint riverside town of Luang Prabang, Laos. Incapable of witnessing one more stack of elephant pants on sale at the night market, my research led me to the upstart Backstreet Academy. 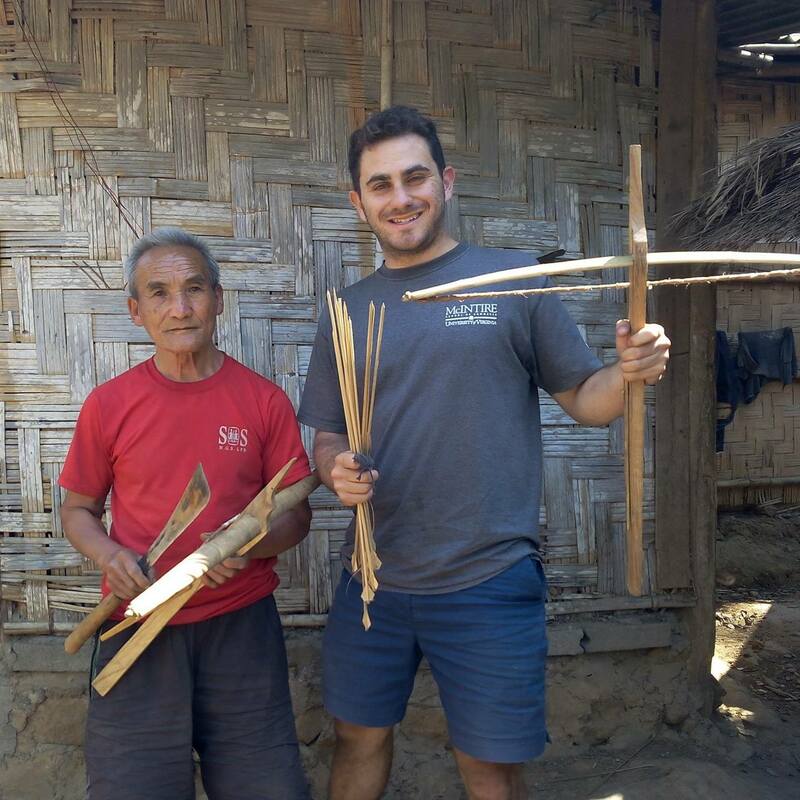 Through a slick online marketplace, the company provides short lessons in traditional skills (including rice farming, hat making, and knife crafting) led by local instructor-tradespeople across Asia. Furthermore, the teachers are usually low-income and marginalized in their own countries. All of Backstreet Academy’s unique offerings intrigued me, but the little kid inside of me jumped at the chance to make and shoot an authentic Hmong wooden crossbow. What’s more, the $25 price for a four-hour private session facilitated by a translator was unbeatable. Best of all, I was getting one-on-one instruction from 84-year-old Chaisong, a Hmong master crossbow craftsman, in his village workshop. He guided me in whittling bamboo, puncturing precise holes with a fire-heated metal rod, and, of course, proper crossbow archery form. From Chaisong I learned not only about ancient weapon building but also daily life, family, and politics in Laos. In the meantime, I had the most fun in over two weeks there. As an elderly man of a minority ethnic group, he had little opportunity, yet in this case he was making significant income for his family while Backstreet Academy generated revenue for itself. More importantly, as a customer, I had a fantastic experience because of Chaisong’s age and minority background, not in spite of those characteristics which we typically deem disadvantages. It was due to Chaisong’s accumulated knowledge in a non-mainstream craft that I enjoyed myself. From Econ 101, I recognized this as an example of a ubiquitous phenomenon that drives our work and buying decisions every day. Called competitive advantage, the concept predicts that businesses with superior attributes, such as new technology, highly-skilled labor, and access to natural resources, will beat their rivals. Given its 97.6% TripAdvisor recommendation rate along with rapid expansion into new destinations, certainly Backstreet Academy’s activity offerings have a competitive advantage. Once I realized how “disadvantaged” personnel actually could give a commercial advantage over other businesses, I began seeking them out in the rest of Asia. Next, I visited a popular massage shop in Chiang Mai, Thailand with exclusively blind masseurs. Studies show that other senses, in this instance touch, are heightened when one sense is lost. As a result, I got one of the most relaxing massages of my life. Later, in the bustling historic town of Hoi An, Vietnam, I found respite from busy walking streets inside Reaching Out Tea House. Staffed by hearing-impaired servers, the cafe requires patrons to silently communicate orders using labeled wooden blocks and writing. I soon melted into the room’s quiet serenity, which I was grateful for after days of intense traveling. Again, it was a disability that worked as an advantage to make me so satisfied; and considering Reaching Out is rated #1 of nearly 500 restaurants in Hoi An, I wasn’t the only happy customer. In over four months traveling through Asia, I’ve seen countless examples of businesses utilizing disability and marginalization as a competitive advantage. Back in the US as well there are similar organizations profiting from people’s differing strengths, such as a car wash with autistic employees, while adding thousands of jobs. Consequently, we should ask ourselves why this principle remains on the fringe even though disabled and marginalized people are powering businesses all over. Unfortunately, we’re limited by our obsolete beliefs. If we think that disabilities aren’t suited to employment, then no one ever tries to disprove that fallacy. We need more businesses serving as role models and risk-taking entrepreneurs willing to shatter misconceptions. Charity and sensitivity training are well-intentioned, but they aren’t solving the root of the problem–we don’t appreciate all people’s differing competitive advantages. Now pure, self-interested capitalism is the only force that can shift us from pity to profit. Then, we can spark a reconsideration of the importance intrinsic to all humanity.